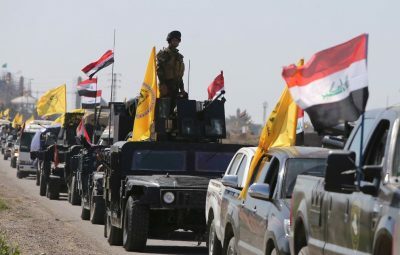 The Iraqi Popular Mobilization Units (PMU) have repelled a large ISIS attack in western Nineveh near the Iraqi-Syrian border. On Monday, the PMU reached the border with Syria and started digging trenches and preparing positions in order to secure the recently liberated border area and to prepare for a push to liberate villages north of the important ISIS-held town of al-Baaj. The PMU advance will be actively supported by the Iraqi Air Force. The same approach was implemented during the liberation of Qairawan in May. If PMU fighters are able to liberate al-Baaj from ISIS, they will significantly expand their control zone along the border with Syria and will set a foothold for possible operations in the direction of Qaim, the Iraqi side of the Syrian al-Bukamal border area. The successful anti-ISIS operation of the PMU in the border area faced a cold response from US-backed forces in Syria. Kurdish security forces affiliated with the US-backed Syrian Democratic Forces (SDF) declared the PMU a threat to the SDF-held area. Then, reports appeared in pro-SDF media that the US-backed force will not tolerate any kind of corridor between Iran and ‘the Syrian regime’ and will oppose any PMU attempt to enter the Syrian territory. Meanwhile, sources in US-backed militant groups operating in southeastern Syria revealed that the US-led coalition increased supplies, including vehicles and anti-tank guided missiles, to its proxies operating in the al-Tanf area near the border with Iraq. However, this statement is just a formal declaration. Fighters of some PMU factions such as Hezbollah al-Nujabaa and the Al-Imam Ali Battalions, are already deployed in Syria. The campaign in Baaj runs simultaneously with government troop operations in Mosul, the biggest ISIS stronghold in Iraq. Iraqi security forces are working to tighten the siege on ISIS terrorists in Old Mosul and in the nearby areas and are preparing for a final push into the ISIS-held area. The terrorist group is in no-win situation.